Meet Sarah Reinertsen our latest guest contributor. The fortunate instance of a bus breakdown in the Himalayan foothills – after the bus driver tried unsuccessfully to fix the malfunction with a 2×4 and a hose – provided Sarah with the inspiration and opportunity needed to contemplate her future (that is to say: a pretty view and a long wait). The answer was instantly clear as the pages in the diary began to fill up: culinary school. A year of mature-aged backpacking and a year of mature-aged culinary study later, Sarah combines her love and knowledge of food with tech, travel, writing and the odd failed kitchen experiment. One day, it might even be clear where all of this is leading. Never fear, I’m not going to wax poetic with clichés encouraging you to eat sweets (or drink good wine) based on lifespan length and rose appreciation. I have a thing or two to say about restaurant desserts. But after 4 months of pastry school, my desire for refined sugar has grown significantly – as has my appreciation for thoughtful and balanced desserts. And, because I am what I am, my criticism of poor execution. Few restaurants in North America employ a pastry chef, relying on the acquired pastry skills and vision of the head chef to make up the dessert menu. Restaurant economics, not to mention space constraints, explain much of this. We are not a (refined) dessert culture so it would make little sense for most to invest in the talent, equipment and climate-controlled prep area to appeal to a small minority of restaurant goers. …can all be executed without many specialty skills or equipment. So, though sometimes disappointing, I am forgiving of a dessert menu that looks like an afterthought from a chef whose main focus just isn’t on the sweet side. 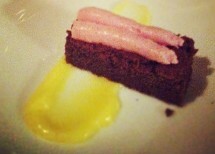 The same, however, cannot be said for desserts within pricey degustation meals. Several months back, a friend joined me in a five-course tasting menu from a longstanding prominent Vancouver restaurant. There were hits and misses throughout the evening, and until the time dessert course we weren’t blown away by much. But to say we were blown away by the dessert would be an understatement. It was horrifying. Dry misshapen “brownie,” topped with a berry mousse that resembled in texture and appearance the type of 5c comic-wrapped gum you’d find on the bottom shelf of a 7Eleven back in 1985. One could say the same year that inspired the plating: piped in two streams across the brownie, I wondered if the kitchen was ran out of the mousse or intentionally stopped short. Caption: Sigh…plating not even Instagram can save. Were it not for the dessert, I would have left the restaurant thinking: it was OK, maybe they were having an off night. That 3rd course was pretty good. As it was, we were speechless, and not the least bit offended. What on earth was the chef thinking? Why not just put out a [miscellaneous infused] crème brûlée and call it good? And you’re charging me how much for this?? Six months on, I can still taste the cornstarch that was used to stabilize an inexplicable smear of “lemon curd.” And, clearly, I’m still talking about it. Recently, too, I went to a very fancy-pants restaurant in a similarly-styled resort in the suburbs of Phoenix. It was the type of place to begin with a traditional Hopi greeting, serve 80% of the courses with some form of table side flare and – I swear I’m not making this up – accompany the distribution of each menu with an in-depth presentation of the original artwork on the cover. As with the previous restaurant, we knew we were pushing $200 a head as we crossed the threshold to the tune of a live Native American flute performance. This time, though, execution of each dish was pretty much flawless: delicious, interesting, and thoughtfully presented. In fact, our chief complaint was the portion size was far too large. We were stuffed by dessert but I was excited to see what the pastry kitchen had to contribute to our experience. My first instinct should have been heeded when I observed a few chocolate molé soufflés dancing through the dining room: not only had they exhaled, but they didn’t appear to have a lot of breath to begin with. But I ordered the apple crumble with vanilla bavarois, anticipating the same creativity and attention to detail that was shown throughout the main meal. At first glance it’s lovely: height from the “crumble” tuille, warm cider pooled around the base, perfectly cooked apples packed into an entremet ring for neat presentation, and topped by a cylinder of bavarois with just the right amount of gelatin. But we’re talking apple crumble at a 5 star restaurant. I don’t really think the cider poured table side added much to the dish beyond showmanship. Each cut of apple was a different size, depth, shape – and to be honest, they were just a bit bland. Then, my chief disappointment: the task of the crumble component was left to one tiny tuille. It was finished by the time I got to the third bite of rhombuses. 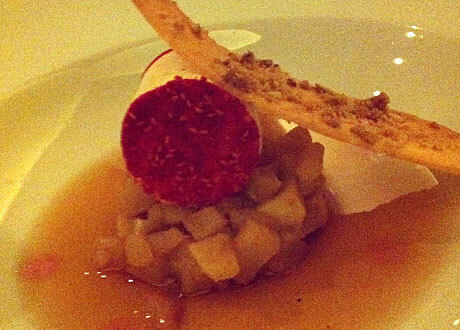 Essentially, at a 5 star restaurant, my meal was finished with stewed apples. And it’s all I remember. Pastry school has turned me into a lover of great desserts, and taught me to appreciate the incredible skill that goes into the craft. Whereas I once passed on the sweet option, I now take delight in savouring a considered final course – flavour, texture, colour, temperature, technique and imagination. And there can be a satisfying, homey comfort in a simple but well-executed one, even if it is clear that pastry is not where the chef’s interest lies. But too often dessert is mediocre, or worse. Something that doesn’t match the mains in terms of taste, presentation and creativity can take the wind out of the dinner’s sails (or, soufflé, if you will). Dessert is the last impression that diners have of the restaurant. It can rescue a mediocre meal or absolutely destroy it – and perhaps most distressingly it can sour an otherwise fabulous one. Who’s Got the Most Creative Dessert Menu? /On The Side /Fermented Black Rice? For Dessert?